The most remarkable feature of the Sun 2 Standard typewriter is its odd inking mechanism. Any type bar that went on its way to the platen, would first hit a small ink roller, before hitting the paper. The roller in turn would be thrown to the side where it would bounce back from an ink reservoir, picking up fresh ink in the process. 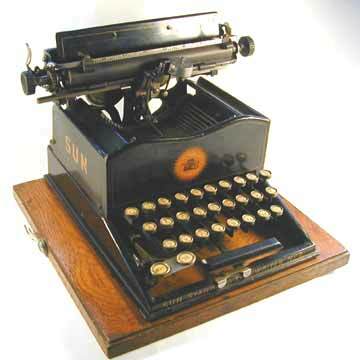 The Sun Standard 2 appeared in 1901 (there was no number 1), 15 years after the Sun company had introduced a number of linear index typewriters, very similar to the Odell. Not only the inking mechanism on the Sun 2 was special. So was the escapement. The escapement was operated by a handle that was struck by the type bar just before it hit the platen. The Sun Standard stayed on the market until 1924. It appeared in different countries with different names, such as Nova and Star. The machine, including some of the export models, also appeared in green.